The company name might indicate that it is small, and the same goes for its best-selling product—but for one Quebec bakery, speed is the key to growing the business. Headquartered in Blainville, Que., a suburb of Montreal, the Serge Bohec-founded La Petite Bretonne Inc. manufactures baked goods for breakfast or snacks for customers throughout Canada, U.S., Mexico and the Caribbean, with its Micro Croissant brand, a small version of the standard-sized croissant roll being its top-seller. (L to R): Serge Bohec, President & CEO, La Petite Bretonne Inc.; Olivir Jouffret, End-user Solutions Sales Representative, Schneider Electric; Charles Bergeron-Vachon, Vice-president, Operations, La Petite Bretonne. In 1964, Bohec arrived in Montreal with his father from his hometown of Brittany, France, with the rest of the family joining them in Canada a few months later. A sign of the times perhaps, but Bohec recalls that it only took him about an hour after arriving in Canada to land that job that already paid more in salary than back in France. According to Bohec, the madeleines being made in Canada, though well-known amongst the bakers, did not have the same consistency as what he was used to in France, and he set about to prove that what was being made here could be made better. After proving his point beside the stove and gaining a promotion, in title only, he asked for a raise in salary. Denied the financial incentive, in 1966 Bohec was inspired to quit this job and launch his own business making a better madeleines product. Remarkably, he was only 17 years old. Baking the little cakes in a rented pizza oven at his parent’s home, Bohec launched his company under the name La Petite Bretonne as a way to pay homage to his native province of Brittany. From pastries to croissants, tea cakes and chocolate breads, the Blainville-based La Petite Bretonne offers a great taste sensation for everyone and for every occasion. 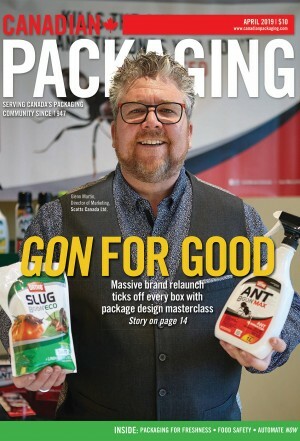 “Back in France, everyone involved in the baking industry likes to consider themselves an artist,” Bohec told Canadian Packaging magazine during a recent interview. Not one to shy away from hard work, Bohec worked his baked magic from his parent’s basement for about two more years before shifting things to a nearby pastry shop he rented during the night hours. During the day, he made deliveries on his bicycle to small grocery stores, delicatessens and butchers, but not to any chain stores. Back then, Bohec says that he used to wrap the madeleines, a dozen at a time, in cellophane and seal them with his mother’s hot iron. “If I could, I would sometimes secretly ‘borrow’ my father’s car to make deliveries, but times certainly have changed,” chuckles Bohec. 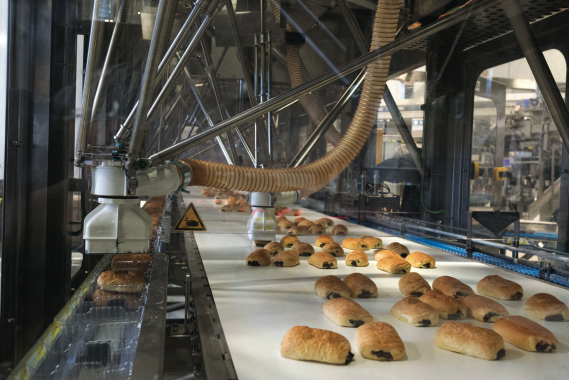 The model P4 Delta-3 robot kinematics manufactured by Schneider Electric gently and quickly pick up chocolate buns and place them neatly into plastic trays on the De La Ballina packaging line operating at the Le Petite Bretonne baked goods manufacturing facility in Blainville, Que. In 1967, Bohec rented his first real manufacturing facility, and after several other expansions and moves, he relocated the business to a facility he purchased in Blainville, Que., in 1976. Nowadays, the 85,000-square-foot plant houses the headquarters and main production area for two of La Petite Bretonne’s products—two sizes of its chocolate breads and Micro Croissants. The remainder of the company’s products are produced at its 80,000-square-foot sister plant in Joliette, Que. 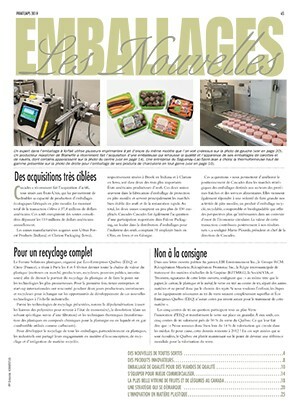 Utilizing the precise and robust Schneider Electric pick-and-place robotic system, the De La Ballina packaging line was purchased by the La Petite Bretonne bakery in October of 2013, instantly earning it company-wide rave reviews for the huge uptick in speed and accuracy that will help it in its goal to enlarge its market share. “La Petite Bretonne is no longer the one-man operation it was when I started this business, and our growth in the market has been quite spectacular every year since,” says Bohec. By 2003, the company was looking to build a new plant in Blainville with the express job of baking the Micro Croissants exclusively, with everyone eventually moving in to the main facility at the start of 2007. 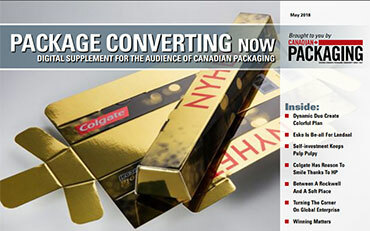 With sales and production levels soaring, by 2011 the Blainville plant required an additional expansion—adding 49,000 square feet to take it up to its current size and capacity levels. La Petite Bretonne is now operated by a total of 166 employees working at the two plants, running five-days-a-week, 24-hours-a-day with two complete shifts and one partial production shift. Some of the production staff, Bohec notes, are used to operate the warehouse and to get product prepared for early morning delivery to customers. 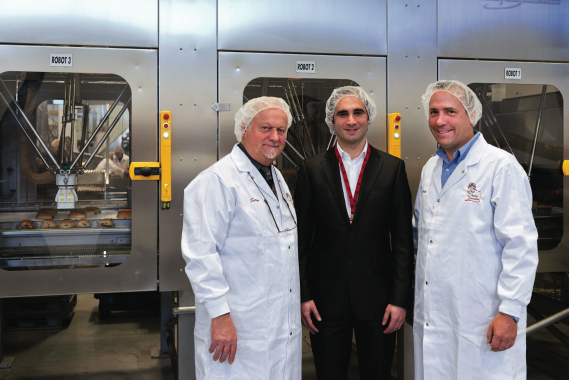 All told, the Blainville facility produces an impressive 720,000 Micro Croissants, 140,000 chocolate breads and 40,000 mini chocolate breads every day, according to Bohec. • Strawberry buns, eight-piece packs. For its private label manufacturing big runs, the bakery produces: mini croissants under various labels in packs of 18, 22 or 24 units; molasses cookies under the Grand’Ma label with packs of 12 or eight units; and Oatmeal Tag on the GO cookies in six-packs and packages of 12 two-packs. Although Bohec humbly calls his company small in the croissant business segment, he says he considers La Petite Bretonne to be anything but petite in terms of overall capabilities. 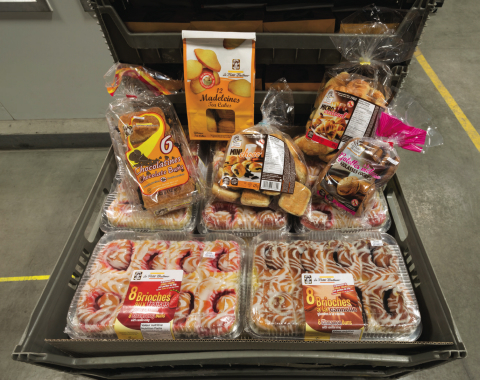 The company’s products are primarily sold in major retail chain grocery stores in the baked goods section, but it also retailed to smaller corner grocery shops, Bohec explains. 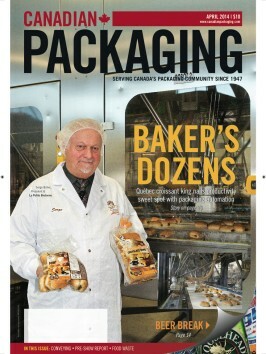 “The baked goods industry is a highly competitive one, with plenty of big name players,” notes Bohec. 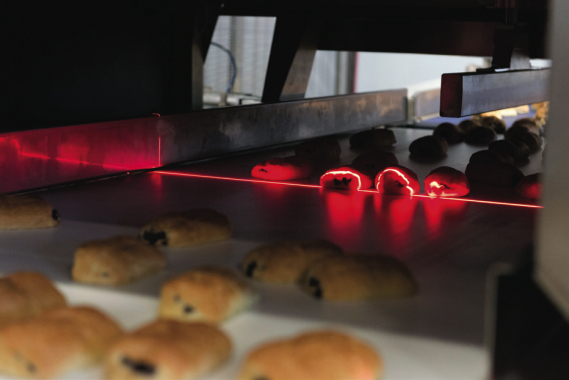 To ensure product conformity, after baking and cooling, chocolate buns at La Petite Bretonne are moved through a laser vision inspection system designed and built by the France-situated manufacturer De La Ballina, part of Pattyn Packing Lines of Belgium. A close-up view of the De La Ballina laser vision inspection system. Bohec points out that the La Petite Bretonne products are free of artery-clogging transfats, are produced in nut- and peanut-free facilities, and can be kept frozen for up to six months. Bohec says that most of the products manufactured by La Petite Bretonne are packaged in portion-control sizes that make them convenient to enjoy for breakfast, dessert or as a snack. “It was back in 1982 or so that the company developed products with a shelf-life of 21 days,” says Bohec. “For baked goods that is a huge advantage and it’s something we are quite proud to boast of today,” Bohec states. Even before the latest technological upgrades to the bakery, La Petite Bretonne has twice been featured on television, with the popular: How It’s Made series describing the creation of its Micro Croissant, and the Food Factory show demystifying the production of its Chocolate Buns. In the case of the croissants, the primary ingredients of margarine, yeast, cold water, sugar, a bit of salt and white all-purpose flour are blended slowly in an industrial mixer to form the dough and then quickly kneaded. After passing through 16 rollers that flatten and thin the dough, the product passes through a laminator that creates the flaky layers that give every croissant its signature texture and appearance. At the laminator stage, a 20-kilogram block of margarine is extruded into a one-centimeter sheet and then enveloped by the dough sheet, before being flattened by rollers to a centimeter in thickness. This inserting and folding is done over and over again at the next station until each dough block comprises a total of 243 layers. After being hand-placed in a plastic wrap, the dough sits for eight hours in a refrigerated room to harden, after which the dough is again moved through rollers to thin and widen it. Razor-sharp cutters then slice the dough into seven narrow bands 10-centimeters-wide, before it is then cut into isosceles triangle sections. Robots are then used to align the dough all in the same direction—widest side forward— where it is then rolled into the more familiar crescent-shape, with two of the formers creating 50,000 raw dough croissants every hour. Next, the raw croissants sit for an hour within a proofer, where steam and humidity activates the yeast. They are then moved to a conveyor and slowly moved along a tunnel oven for 14 minutes of baking at 175°C. “During the baking process, air bubbles and steam help separate the 243 layers, which in turn creates the Micro Croissants signature flakiness,” advises Bohec. With the fully-baked, golden brown croissants now in their most fragile state, great care is taken to ensure they maintain their form, as they are depanned and transferred to a conveyor that moves the baked goods on a 900-meter-long journey up a spiral conveyor system and back down again to cool to room temperature. At this point, they are ready for packaging. After a quality control inspector examines each croissant for a consistent shape, the product is moved through a De La Ballina laser vision inspection system for a further quality check. 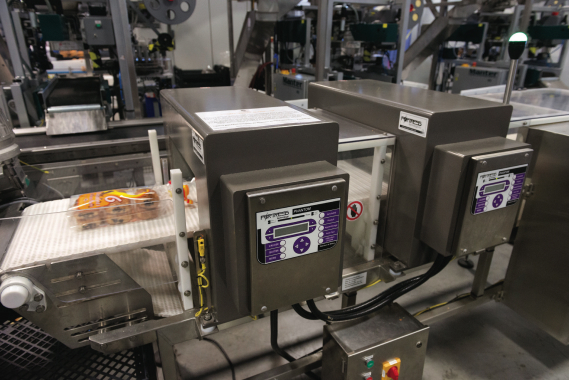 From there, they move up through one of a pair of Manter baggers, where a multitasking robotic system opens up a clear plastic pouch, slaps a label onto it as the appropriate number of baked goodies are dropped down into it, and a Kwik Lok system applies a plastic clip to secure the bag to seal in the freshness. (Incidentally, Kwik Lok is credited with inventing the plastic bread clips that are featured on nearly every retail bread pack.) The packaged croissants are then boxed, sealed, layered and then stretchwrapped onto pallets for delivery to customers. The La Petite Bretonne packaging line employs the power and accuracy of a pair of Phantom metal detection units, manufactured by Fortress Technology, as part of its stringent food safety assurance protocols. In the case of the Mini Chocos product—which has a slightly different production cycle—it takes about 90-minutes to cool on the spiral conveyor. 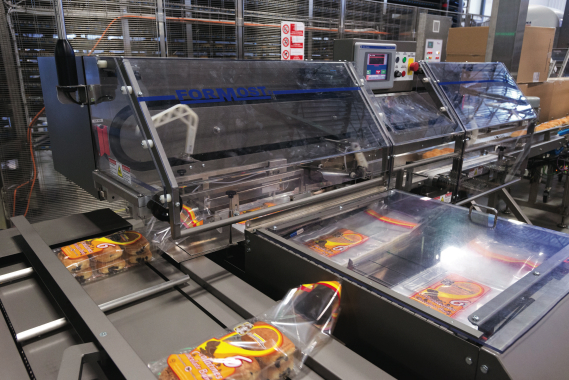 After the quality control check, the products are moved past another laser vision inspection system from De La Ballina, before the product is packed just as the Micro Croissants were, except that this line uses four Manter baggers and four Kwik-Lok closure units. “We have been in business since 1966,” Bohec says with a hearty laugh. “We have a small product range that we run via a total of five production lines, but what makes us successful is that we always concentrate our efforts on those products. Some of that marketing takes place right in the baked goods aisles, as La Petite Bretonne offers grocers its own retail-ready display systems in order to maximize the use of floorspace and to provide greater visibility of its products to the consumer. As part of its latest investment in 2011, the company began a plant expansion in one under-used area of the Blainville facility. Continuing in 2012, it installed a brand new chocolate bread production line, following that capital expenditure next year with the installation of a packaging line for the same products. Baked goodies inside a plastic tray are moved through a pair of Formost Fuji horizontal baggers that quickly open up individual plastic bags to allow the trays to enter before sending them on its way to be individually clip-sealed. Naturally, food safety is a huge concern for everyone involved in the bakery industry, which was why La Petite Bretonne took the time and effort to achieve British Retail Consortium (BRC) certification, a standard recognized by the GFSI (Global Food Safety Initiative), a collaboration between global food safety experts, retailers, manufacturers and food service companies to ensure the provision of safe food to the customer. One of eight Kwik Lok clip closure systems used by La Petite Bretonne for sealing its bagged products. According to Bohec, other initiatives attained by the bakery include: C-TPAT (Custom-Trade Partnership Against Terrorism), which provides safeguards to ensure ingredients being shipped in and out pose no danger; and the Kosher certifications from MK Kosher of Montreal and Tablet-K Kosher of New York. While Bohec says that having the best equipment is a necessity for any company to succeed, he admits that although his facility is filled with top-notch machinery, there have been instances where he had to create the right machinery for the right job all by himself. For example, Bohec designed and built equipment for manufacturing chocolate breads himself because he couldn’t find any. In the early days, too, when purchasing equipment was prohibitively too expensive, he built his own, once using parts from an old hospital bed and a bicycle. 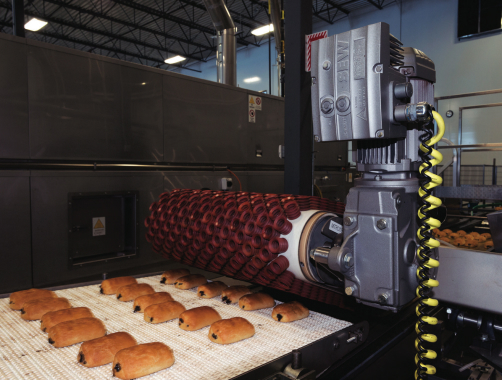 “After a trip down to see a food machinery exhibition in Las Vegas, I mentioned that I had a unique machine specifically designed and built to create chocolate breads,” explains Bohec. Following essentially the same production process as the Micro Croissants and the Mini Chocolate Buns, the regular-sized Chocolate Buns are packaged in a manner best described as a more high-tech approach, whereby robots pick up the product, place them one at a time into plastic trays, which are then pushed into a plastic bag and sealed with a plastic tie. Bohec says the robotic system is part of La Petite Bretonne’s forward-thinking competitive mindset that compels it to maintain the most up-to-date equipment available on the market. 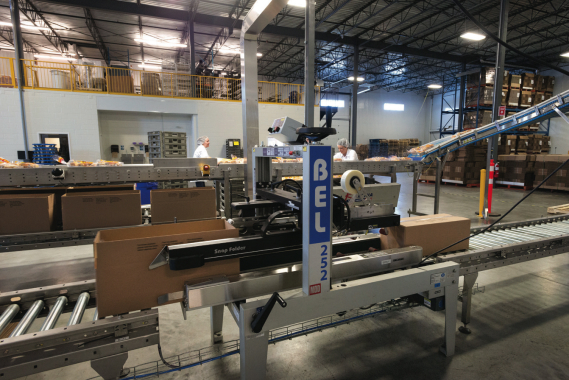 In October of 2013, La Petite Bretonne purchased a robotic pick-and-place system, as well as an entire packaging line, including a vision system to pilot the robots, conveyors, and horizontal and vertical baggers from De La Ballina. 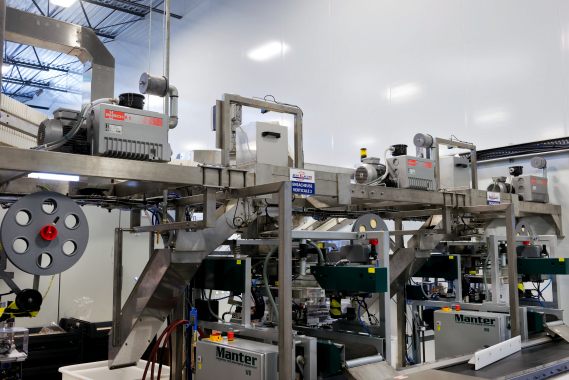 After Bohec had conceived a plan to add the new production line, he contacted the well-respected system integrators PLAN Automation—headquartered in Orangeville, Ont., to provide quotes for a complete package, beginning at the point where fresh-baked goods exit a cooling area. 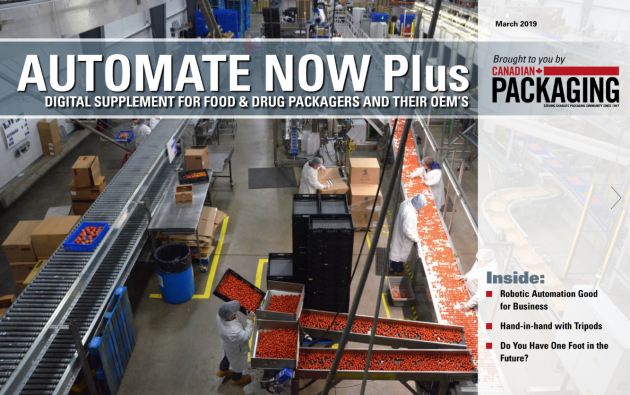 Additional equipment supplied by PLAN Automation included: two Fortress Technology Phantom metal detection systems; two Wexxar WF20 automatic case-erectors and two Belcor BEL252 automatic case-sealers from Wexxar/BEL, a Pro Mach Industries division; an Aesus labeler featuring Herma labeling heads; and a pair of wicket bagging systems from Manter. Busch Vacuum Technics R-5 oil-lubricated vacuum pumps helps provide lifting power to equipment. According to Bohec, the eight-station robotic pick-and-place system from De La Ballina is a work of synchronized rhythmic genius. The system uses eight P4 Delta-3 robot kinematics, manufactured by Schneider Electric, as well as PacDrive 3 software that along with the De La Ballina camera vision system allows grippers to accurately, quickly and gently pick up individual baked breads and place them within a plastic tray. 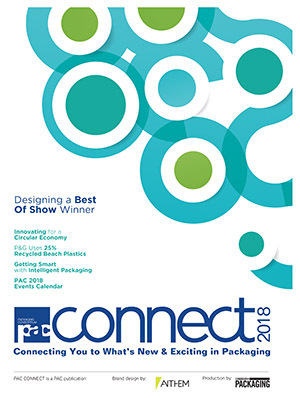 Headquartered in France, but operating with offices around the world, including many across Canada, Schneider Electric is known primarily as a global specialist in energy management, but it also boasts a wealth of expertise designing automated packaging systems. One of a pair of WF20 corrugated case-erectors from Wexxar/BEL used by La Petite Bretonne to protect its fresh-baked goods during transport to retail customers. According to Schneider Electric’s OEM (original equipment manufacturer) business development & ADE (application design expert) Luc Richard, De La Ballina is a complete systems provider who work closely with Schneider Electric to implement their robotics solution, featuring the P4 robot that is part of its PacDrive High Performance portfolio. Supplied by PLAN Automation, the Aesus labeling system applies adhesive labels to plastic bags of product. 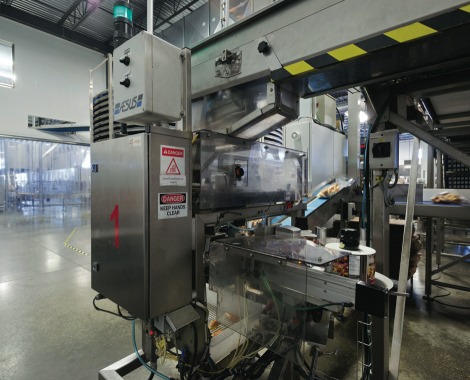 Richard notes that the P4 Delta-3 robots rely on a vision system that enables it to accurately pick the chocolate breads from the conveyor line and place them gently and quickly into the plastic tray without damaging the product. Bringing it all together, the robotic system functions flawlessly thanks to its PacDrive3 synchronized servo axis solution that integrates motion, logic, programmable limit switches, temperature control and, of course, robotic kinematics into its software, Richard explains. “De La Ballina chose to work with Schneider Electric because they like our PacDrive system,” relates Richard. Richard adds that the P4 is perfect for companies such as La Petite Bretonne because the robot system is hygienically designed for food applications, which features a washdown rating up to IP 65. 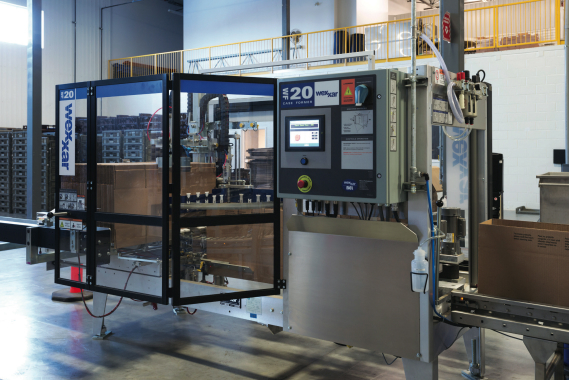 A BEL 252 case-sealer boasting a Snap Folder feature quickly tapes shut corrugated cartons filled with product. “Made exclusively with nonfibrous materials, the P4 is the best offer on the market for the food industry,” proclaims Richard. Because every job is important to the folks at Schneider-Electric, support staff from the company traveled to the De La Ballina factory in France before the machine was delivered to La Petite Bretonne. “By doing that, we were able to finetune the equipment to ensure a better start-up on site at the bakery,” says Richard. After the machine was delivered, De La Ballina and Schenider Electric worked with the local Canadian Schneider Electric team to finalize the installation and ensure it was up and running to the full specifications of Bohec and La Petite Bretonne, he relates. 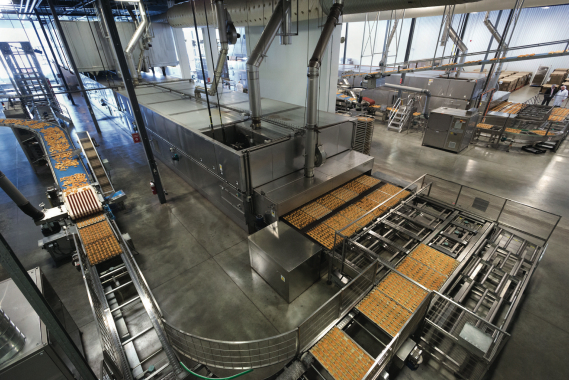 An overview of the La Petite Bretone production, showing baked treats exiting a Mondial Forni oven (center) to a 900-meter long conveyor line for cooling. One Wulftec International Inc. Smart series stretchwrapper. 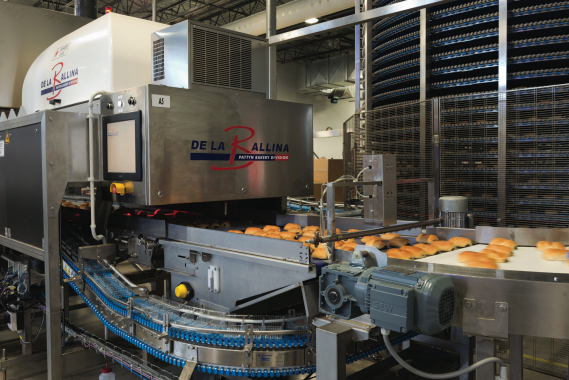 Two complete packaging lines from De La Ballina. 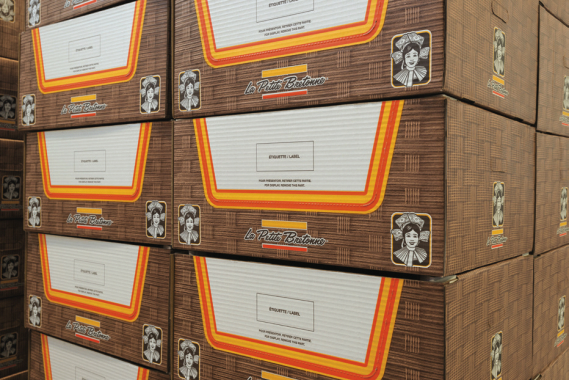 Mitchel-Lincoln provides La Petite Bretonne with corrugated cartons to pack and ship products to customers. 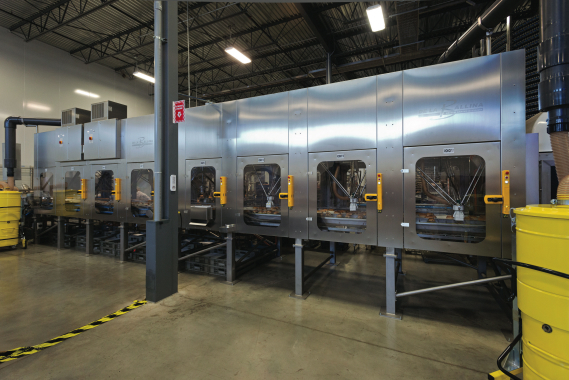 Bohec says that La Petite Bretonne also engaged the services of Wellbake Equipment of Concord, Ont., a baking equipment specialist that acted as a broker on their behalf, helping the bakery choose equipment for its first and second production lines. While some might quibble over the expense involved in always trying to have the most technically advanced equipment, Bohec enjoys embracing new technologies with grand aplomb. “I’ve certainly purchased my fair share of used equipment in the past—and there’s nothing wrong with that,” notes Bohec. 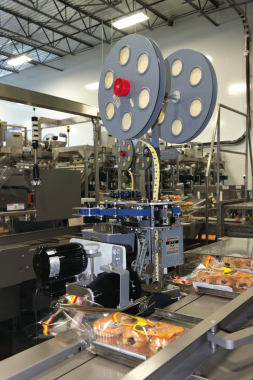 An SEW-Eurodrive motor powers a rubber head roller that gently transports the freshly-made baked goods from the oven line down onto a cooling line. “But to ensure the continued success and growth of La Petite Bretonne we would be doing ourselves, our employees, our customers and our consumers a huge disservice if we didn’t continually make commitments to capital investment in new machinery,” he states. “While our recipes have generally remained the same, certainly the introduction of new equipment has helped us improve the way we produce our baked products. “We can certainly produce the same high-quality product we have always made, only now we can do it with much greater speed,” he concludes.